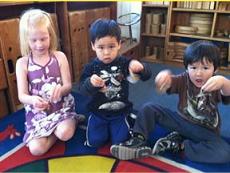 Baby sign language is part of the curriculum of the baby music classes. Parents who take this class with their babies will also receive handouts and instruction about using sign language with your baby. The instructor is an interpreter for the Deaf and former counselor for the Deaf as well as a sign language instructor. Text: "Sign with your Baby" by Joseph Garcia. Jingle Jamboree Music for Infants presents enjoyable singing and movement activities for children 6 to 15 months. Each song is focused on the young child's singing voice and is accompanied by some form of movement, rhyme, or steady beat focus. The teacher and parents are the models for the infants to follow. As the class progresses, you will begin to see your little one respond to the music as the class and musical activities direct. It is very exciting to hear your baby make noises that match the pitch and direction of the song melodies. 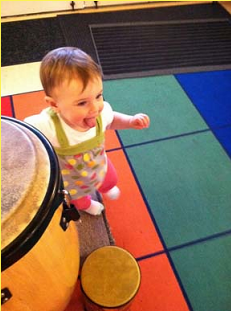 Your baby will also begin to imitate your example of the steady beat. It is a thrilling moment the first time they move their arms to the beat of the music. Consistency is important in the musical development at this age. Thus, regular attendance and singing to your baby at home is necessary for musical progress. Jingle Jamboree Music for Toddlers presents enjoyable singing and movement activities for children 15 months to 2 years. 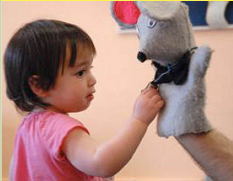 Each song is focused on the young child's singing voice and is accompanied by some form of movement, rhyme, or story. 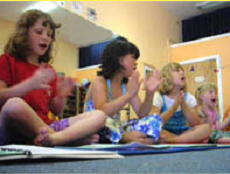 While all children are encouraged to participate, toddlers are not expected to perform during the class. At this young age, most children will simply enjoy the activity and take everything home to try out in front of their families. The teacher and parents are the models for the children to follow. All parents should be actively involved in the singing, movement or accompanying song activity. Consistency is also important in the musical development at this age. Thus, regular attendance is necessary for the children to progress. Jingle Jamboree Music for preschool age children will be based on the Kodály method which teaches music literacy through song games, puppets and props. 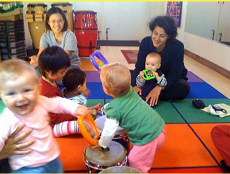 The children will learn new songs and games emphasizing music concepts, including: dynamics of loud and soft, introduction to rhythm, in-tune singing, tempo (fast and slow), music note duration and silence. Movement and singing are tailored to your child's developmental age, creating an atmosphere that is both playful and highly educational. The children will also use percussion and melodic instruments. The sibling class will present a unique musical experience for families who want to enjoy music classes in a multi-age setting. 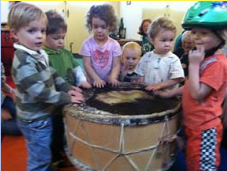 Classes will combine music, activities, dances, movement, percussion instruments, classical music and puppets from the infant, toddler and preschool classes. Material will be specifically designed for the families who register for the class. It will be a unique and musically enriching class. Class Description for "Children's Music - Multi-Age Classes"
Musical materials will be brought in from many different levels to create this incredible multi-age experience for children. 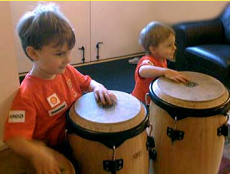 The class will include songs, dances, percussion instruments, puppets, classical compositions, and musical activities that emphasize melodic and rhythmic development as is age appropriate. The class will be designed for those children who are registered for the class. Each series will be a unique experience based on the attendees of the series. We will continue our study of music based on singing games leading to a higher level of music literacy. The Kodály method enables children to read any music by the time they are in fourth or fifth grade. Your children will be well on their way to learning advanced music concepts in this enjoyable class that incorporates games, puppets and fun! 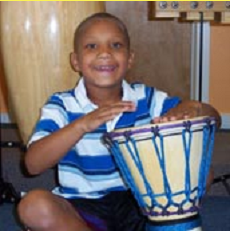 We will also be using Orff instruments such as conga drums, bongo drums, hand drums, xylophones and metalaphones. We will begin music reading with felt music staves concentrating on the first interval of so-mi which is recommended for Western Music. Our rhythm study involves exploring and understanding the quarter note and eighth note. In the second half of the year your children will discover la and do and the quarter rest. Our goal by the end of the Kindergarten year (Fall, Spring & Summer Semesters) will be for your child to read a set of songs that include the notes: do, mi, so, la. 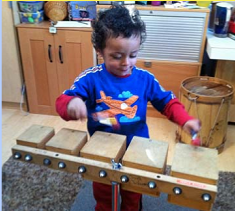 Your child will "write" music using specially designed felt staves, then begin writing music with paper and pencil. The Kindergarten Jingle Jamboree Music curriculum contains its own set of songs, music games, and activities that are different than other levels your child may have previously taken. While some songs may repeat, the bulk of the music will be new.